Good carbohydrates are those which have the lowest glycemic index, glycemic load, and contribute the most nutrient and fiber content to your diet. That having been said, this all but eliminates refined carbohydrates, and makes for a low glycemic diet! 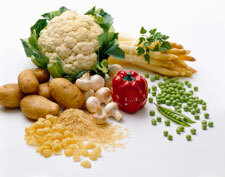 Please remember that quality carbohydrates can come in the form of vegetables, fruits, and grains. Vegetables and fruits are more likely to be eaten in their natural and unprocessed state so right off the bat they tend to be better carb choices. In the past carbs were separated into two types, simple, and complex. However, the use of the glycemic index, glycemic load, and insulin index provide a much better guide than the simple vs complex label. There are a number of nutritious grains that qualify as a good carbohydrate, but the downside to grains in the diet is that they tend to be refined, stripped of many nutrients, and much more glycemic and insulin raising than what is ideal health wise. Grains are subject to milling where the outer shell or husk is stripped off, leaving the kernel. Since grains contain fatty acids, they are subject to rancidity. The reason for processing is increasing shelf life, and incorporating the processed grains into many different types of products like breads, and snack foods. As a general rule, always try and get them in their least processed state. The nutritional content of fruits, vegetables, and grains is also contained in their skins, peels, and husks. Consume this portion as well for the fiber and nutrient content it provides! Needless to say, carbs in the form of liquids are never a good carbohydrate source and are especially problematic in terms of their ability to raise blood sugar and insulin levels, which promote fat storage and other problems. Store bought juice drinks that are held on the shelf without refrigeration should be avoided entirely. They are nothing but liquid sugar. Freshly made fruit juices can be consumed, but very sparingly, because they are also concentrated forms of sugar and thus not very good for optimal health. When choosing carb sources always pick those, which are compatible with your blood type. The blood type diets books will list which are beneficial, neutral, and which should be avoided. This applies even to good carbohydrate sources, as many people have sensitivities to certain foods, which can cause blood sugar problems and inflammation. The Metabolic Typing Diet focuses on the ratio of fats, carbs, and proteins, which are appropriate for your particular metabolic type. Most people (approximately 70-75%) do better on lower carbs and more protein. However the rest can tolerate higher amounts of the best carbs, which should always be your choice when planning your meals. Simple sugars are a nutritional and health disaster, and should never be consumed by anyone who cares about their health, even if their metabolic type handles carbs better than most! I will be updating this article with more information and links soon for a more complete guide to carbohydrates, including a listing of the best carbohydrates for healthier eating and more effective blood sugar management. Care to comment? Feel free to leave your comments below! [? ]Subscribe for cutting edge antiaging information!